Frank is a story teller, songwriter, singer and guitarist. In that order. His rambling anecdotes aim to give the audience more of a connection with his songs. He formed his incredible backing band when he relocated to Wellington from Edinburgh. The band have made incredible progress in the last 4 years, releasing their debut album Fools & Kings in 2015, which reached No.12 in the Official NZ Music Charts. They have embarked on several national tours and have played several festivals across NZ. Inspired by artists such as Pokey Lafarge, Van Morrison, Billy Joel and The Wood Brothers, they play high energy, original music written by Burkitt and arranged by the band. They are released their 2nd album Raconteur at Port Fairy Folk Festival in Australia before embarking on a tour of Australia and New Zealand in March and April 2018. The album was produced by Gerry Paul (Tim O’Brien, The Staves, Mel Parsons) and engineered by Lee Prebble (The Black Seeds, Phoenix Foundation, Fly My Pretties). The band recently won the Vodafone NZ Music Award for Best Folk Artist 2019 which was a huge highlight in the bands career thus far. The band are touring throughout NZ, Australia and the UK in 2019 to support the release of their new live EP ‘Lost But Alive’, recorded at in Wellington in November 2018. Frank Burkitt was brought up in the highlands of Scotland before moving to the ‘big smoke’ of Edinburgh at the tender age of 18. Despite an early musical career of singing the American standards with jazz quintets and big bands, his real musical education came from the pub session. Having always written songs with his trusty guitar from a young age, his music took a distinctly folky turn when he graced the doors of such famous Edinburgh drinking haunts as Sandy Bells and The Royal Oak (2 pubs responsible for both the musical talent and alcoholism of many a Scottish musician). After several (albeit hazy) years of late night music and drinking, Burkitt realised that a noisy pub full of drunk Scotsmen was possibly not the most ideal arena for a young songwriter to apply his craft. He found that the folk clubs of the UK and beyond were the perfect setting for his story-telling and original songwriting and in early 2009 he recorded his first studio album ‘a little less care’ at Castlesound Studios in Pentcaitland. He was joined on the album by fiddler Chris Stone, double bass player Holly Downes (now both of The String Contingent) and the backing vocals of Kara Filbey. They toured the album across the UK, New Zealand and Australia in 2009. Burkitt’s second album ‘Valley of Gold’ which he brought out in 2011, was inspired in many ways by the natural beauty of New Zealand’s landscape and people, the ‘Valley of Gold’ referring to one of his favourite regions of New Zealand Golden Bay. It also contained songs such as Mr ITV, a commentary on the manipulative and immoral nature of reality television. This song was also a demonstration of Burkitt’s ability to convey a profound message as well as an entertaining anecdote in his music. As well as his own original brand of folk music, Burkitt began to take a large amount of inspiration from American artists such as Tim O’Brien and James Taylor. He developed a real love for many American genres such as bluegrass, western swing and country and along with his original love of jazz and blues, his songs began to move away from the traditional Scottish folk music that had shaped his early days. Always a keen traveller and with feet growing ever itchier, Burkitt moved to New Zealand in March 2014. He’d fallen in love with the people, the natural and musical scenery and above all… the fly fishing! 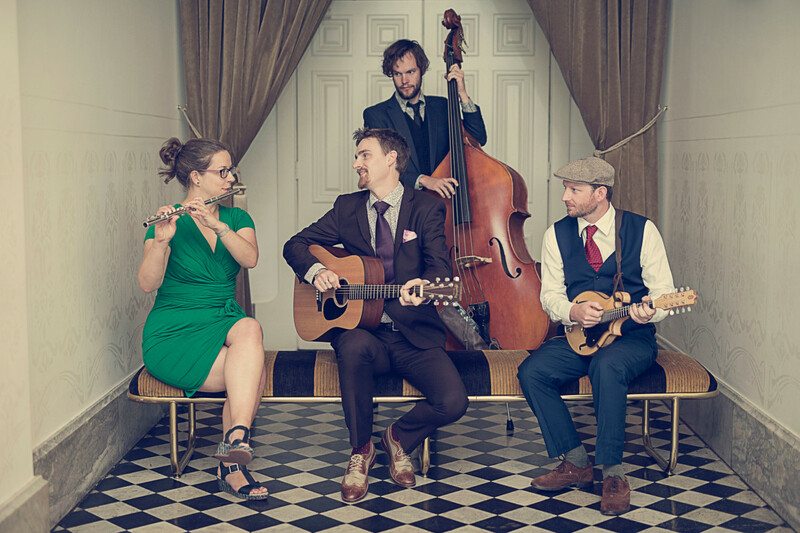 After settling in Wellington, Frank Burkitt was quick to form ‘The Frank Burkitt Band’ which includes Cameron Dusty Burnell (Mandolin), Kara Filbey (Backing Vocals and Percussion) and James Geluk (Double Bass). Now the main project for Burkitt, the band give his songs vibrancy and their virtuosic solos beautifully accompany his original vocals. ‘Burkitt – backed by his four-piece band – hollered, crooned and generally swooned his merry way through a plethora of footstomping ditties.’Edinburgh Evening News.